Insurance Denial Reconstructive Surgery: "Too Cosmetic & Not Necessary"
Too often, reconstructive surgery is denied for insurance reimbursement because insurance companies deem the surgery cosmetic and not medically necessary. The insurance companies assert that a medical necessity requires the illness to cause a functional, medical impairment for the patient, and insurance benefits are not available for a procedure done primarily to improve appearance. But for many seeking reconstructive surgery after sustaining a serious injury, such as severe burns resulting in scars, or overcoming a serious illness, such as a cancerous growth requiring removal, reconstructive surgery is about more than simply improving one’s physical appearance. It’s about leading a healthy, productive, and full life. Read to learn more about insurance denial in the context of reconstructive surgery. Reconstructive surgery is not cosmetic surgery, but insurance companies often attempt to categorize it as such and deny benefits as a result. According to plasticsurgery.org, reconstructive surgery is performed to restore function and normal appearance and to correct deformities created by birth defects, trauma, or medical conditions, including cancer. Examples include cleft lip repair, breast reconstruction following a lumpectomy or mastectomy for breast cancer, and reconstructive surgery after burn injuries. On the other hand, cosmetic surgery is performed to enhance overall cosmetic appearance by reshaping and adjusting normal anatomy to make it visually more appealing. Breast augmentation, liposuction, rhinoplasty (unless required to restore normal breathing or appearance after a severe nasal fracture), abdominoplasty (tummy tuck), and facelift are popular examples of cosmetic surgery procedures. While there is overlap between reconstructive surgery and cosmetic surgery because they share many of the same underlying surgical principles and procedures, they are not performed for the same reasons. 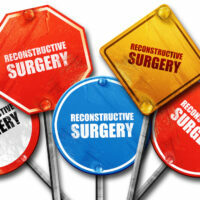 Most people seeking reconstructive surgery wouldn’t be doing so had they not suffered an injury or illness. Thus, reconstructive surgery should be considered medically necessary by insurance companies and appropriately covered by most health insurance plans. In attempting to blur the lines between reconstructive surgery and cosmetic surgery, insurance companies are doing a disservice to their policyholders and potentially acting in bad faith. If you believe you were wrongly denied insurance coverage for reconstructive surgery following an injury or illness, please contact the California insurance law attorneys at Gianelli & Morris in Los Angeles. We’ve fought for policyholder rights in California since 1979, and we can help you obtain the benefits you need to make the most complete recovery possible.